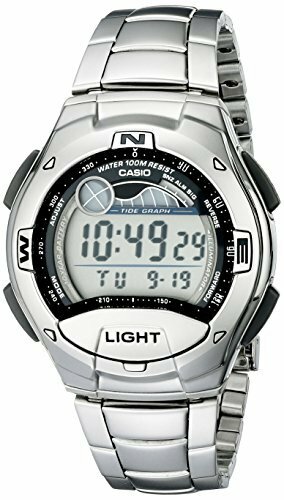 Featuring an innovative moon phase display, the Casio Men's Sport Moon Phase Tide Graph Watch #W753D-1AV keeps you in touch with Mother Nature. The digital-gray dial face is protected by a durable mineral dial window. Embellishing the dial are an easy-to-read time display, a day-date-and-month calendar, and other high-tech details including a countdown timer, a stopwatch, and an hourly time signal. Its sleek look is achieved with a silver-tone, stainless steel band, equipped with a sturdy fold-over-clasp, and other a matching 42-millimeter stainless steel case and stationary silver-tone stainless steel bezel. Presenting a sporty design, this functional timepiece encourages your celestial fascinations. Powered by quartz movement, this watch is also water resistant to 330 feet.